Godrej Ashok Vihar- Godrej Properties established in 1990 is one of the finest builders in real estate sector who has drafted many attractive projects in different cities and each time they bring something interesting so that the home buyers get home to experience luxury, peace, comfort, privacy and more perks. So if you have any future plan, then it is a good news for you, Godrej Ashok Vihar is going to be a top notch property in Delhi where it will let everyone experience the new modern lifestyle and even its green ambience going to boost the quality of air so that all can imbibe a fresh air to feel active. Godrej Ashok Vihar is tentatively holding 2 & 3 BHK apartments where every single unit is going to project over the large area as Godrej Properties has purchased a 27 acres plot from Rail Land Development Authority in Rs 1,100 crore. 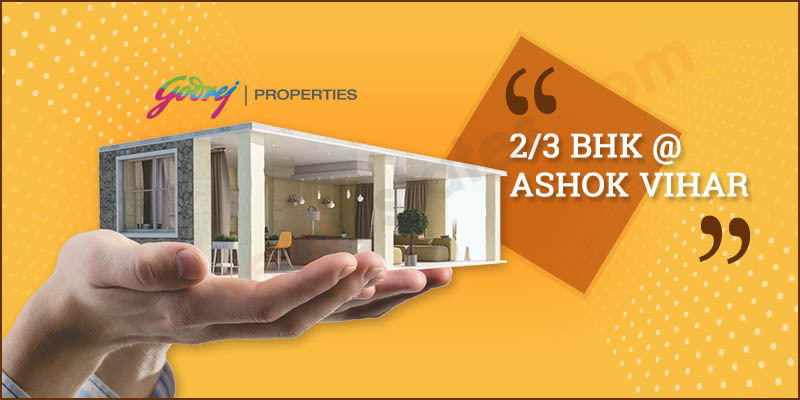 These rates have increased the number of inventories, so if you are planning for the new address for your family, then it is a good time to go for property investment to gain high return and ample benefit in the upcoming time. So with this, there are many more perks available in Godrej Ashok Vihar that is going to ameliorate your family’s lifestyle completely. Think better and take a decision that can give endless benefits because today’s step will add volume for tomorrow. Recently, the builder has added its exclusive residential space in the heart of Gurugram, Godrej Habitat Gurgaon in sector 3 with updated modern services to ameliorate the lifestyle of every resident and give them a secured & happy lifestyle.